When you’re set in the foothills of the Blue Ridge Mountains, surrounded by gorgeous trails, lakes, rivers, and waterfalls and enjoying a climate that says “Yeah!” to a bevy of outdoor activities all year round, you better believe you’re going to need some serious gear. 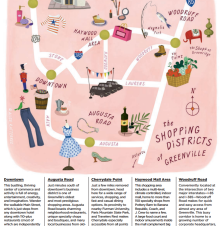 In Greenville, we’ve got a great collection of local, regional and national retailers who have everything you need to take on the great outdoors in style. If your outdoor adventure is more low-impact, think Southern style: seersucker, lightweight cottons and the offerings of local clothiers – like Southern Tide and Rush Wilson Limited. Who cares if you forgot something? You can find a stylish, new replacement or three right here in Greenville.